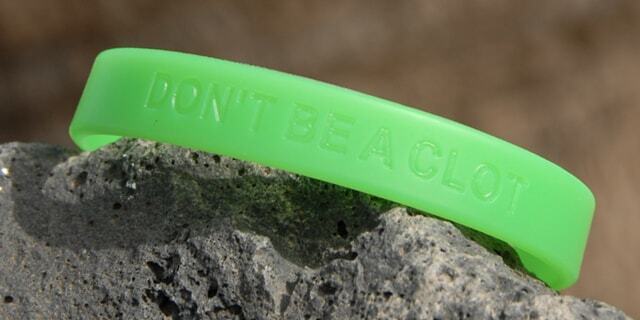 Our custom made Awareness Wristbands are made of 100% silicone. They are enscribed with the words DON’T BE A CLOT on one side and our (old) web address www.protein.org.uk on the other. The lettering is molded into the bracelet so it won’t fade or flake. Bracelets and wristbands have been created to support many causes such as breast cancer awareness, anti-bullying, anti-racism, AIDS and Tsunami Relief, and each carries its own slogan. We invited suggestions on our forum and Anne Holmes proposed the slogan DON’T BE A CLOT to help raise awareness of Protein S Deficiency and Thrombophilia. The wristbands are made of industrial strength polished silicone and are of similar quality to Lance Armstrong’s Live Strong bracelets. They are stronger and more durable than rubber wristbands or rubber bracelets, which can break much more easily. Because the debossed lettering is molded into the design it won’t fade or flake off as some painted versions sometimes do. We are happy to provide links to commercial sites and have details of various items for sale in our products and services section. However we do not endorse any products, services or treatments. The product depicted on this page is an advertisement. The commission on sales from this page help to support our web site running costs. All trademarks and registered trademarks shown on our web site are acknowledged and are the property of their respective owners. Disclaimer: For your own health and safety you should always seek the advice of a qualified medical practitioner and not act on information published on this web site. No responsibility can be accepted for the content or absence of content published on this site for any reason.